Spend time with water today. What needs to be cleansed in your life in order for you to better reflect Christ’s servant heart? In the same way, you who are younger must accept the authority of the elders. And all of you must clothe yourselves with humility in your dealings with one another, for “God opposes the proud, but gives grace to the humble.” Humble yourselves therefore under the mighty hand of God, so that he may exalt you in due time. He Himself is the great Man of Sorrows who knows our ills, Who was called the son of a carpenter, though He was the Son of God and the great Healer of sick souls. Who laboured for 30 years in a humble carpenter’s shop to fulfil God’s will. And God wills that in imitation of Christ, man should live and walk humbly on earth, not reaching for the sky, but bowing to humble things, learning from the Gospel to be meek and humble of heart. John 13-17 is commonly referred to as The Farewell Discourse. Jesus gathers the disciples in an upper room for a final meal and some final teaching to prepare them for his death. He begins by letting his actions speak louder than his words. 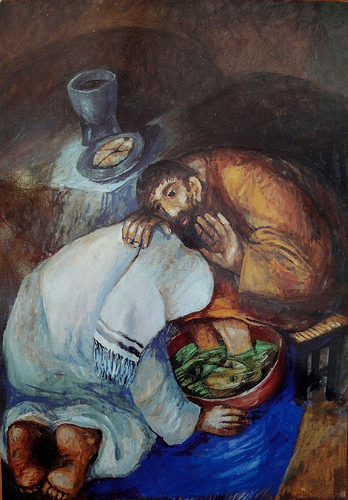 He rises from the table and washes his disciples’ feet as an example of how they are to love and serve one another. Washing feet is the ultimate act of humility, intimacy, and hospitality in his culture. there cannot be any other virtue except in mere appearance. If you go back to the original Greek in this passage, it’s easy to see Peter is struggling to even get words out of his mouth. He’s so astonished and so angered by Jesus’ actions that he’s talking and spitting at the same time. It’s inconceivable to him that the Messiah would be washing feet. Foot washing was reserved for gentile slaves, wives, and children- not Jewish men, not for people who weren’t family, not even for Jewish slaves. Peter will not allow Christ to assume the role of a servant. Jesus explains his actions, and in the high emotion of the moment Peter swings to the other extreme, inviting Jesus to wash his head and hands as well. Jesus replies that footwashing is enough and instructs the disciples to love and serve others as he has loved and served them. Jesus invites us to share life with him, and through him to share life with each other. Humility is not thinking less of yourself; it is thinking of yourself less. Humility is thinking more of others. Humble people are so focused on serving others, they don’t think of themselves.” – Rick Warren, The Purpose Driven Life: What on Earth am I Here for? This entry was posted in Devotions, Gospel of John, Lent/Easter, Poetry and tagged cleansing, Farewell Discourse, Holy Thursday, humility, loving others, Maundy Thursday, new creation, serving, welcome by revlisad. Bookmark the permalink.